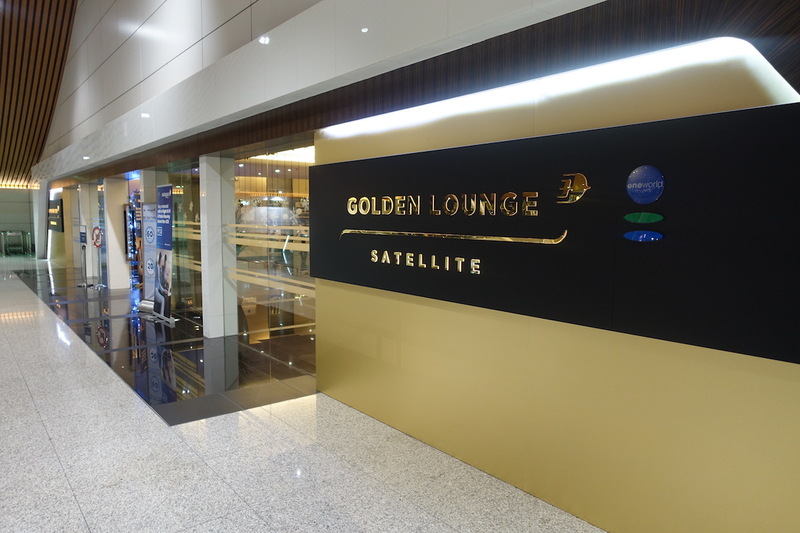 After checking out the business class section of the Malaysia Airlines Golden Lounge, it was time to check out the other section of the lounge. I’m not sure exactly what the other section of the lounge should be called, though. Malaysia Airlines recently rebranded their first class as “Business Suite,” though online I don’t really see much about what that portion of the lounge is now called. This used to be known as the Malaysia Airlines First Class Lounge, but I’m guessing that’s not the case anymore. 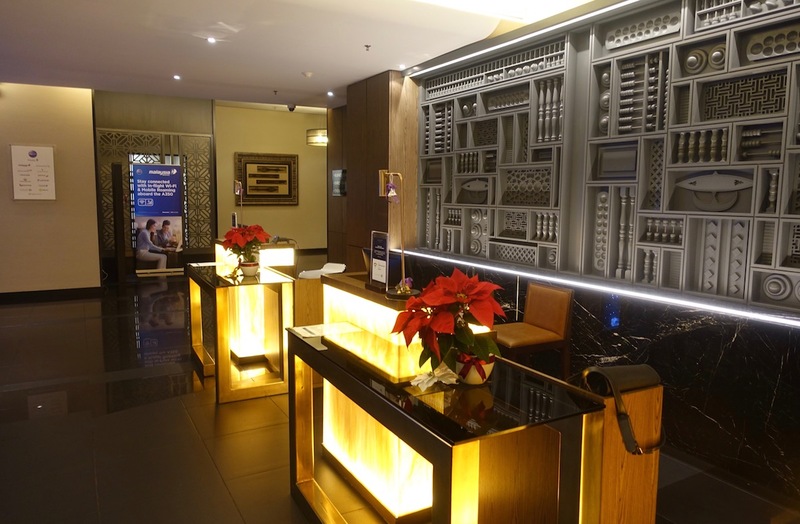 The other portion of the lounge can be used by passengers traveling in Malaysia Business Suite or oneworld first class, as well as oneworld Emerald members. I had access both on account of flying Business Suite, and also because I’m a oneworld Emerald member. Anyway, inside the entrance to the Malaysia Airlines Golden Lounge in the satellite terminal, the Business Suite section is to the right. There are both stairs and a ramp leading up to a sliding glass door. This lounge has also been renovated within the past couple of years, and overall feels quite fresh. Just inside are two sets of four chairs, and then two couches. Then the rest of the lounge consists of two levels. On the upper level are just single sets of seats facing one another along a railing. The lower level has significantly more seating. Seats are primarily facing the windows, though some are angled a bit. The entire lounge has nice views of the apron, including several nearby gates. Just inside the entrance to the lounge and to the right is the dining area. This area has about a dozen tables that look really nice, given that they have white tablecloths. More on the actual offerings in a bit. 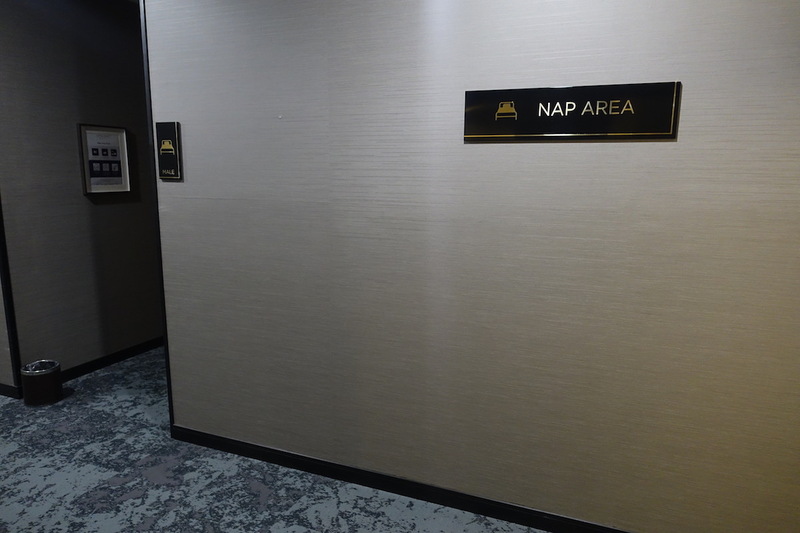 Towards the back of the lounge are some nap areas, which are segregated by gender. For example, the male area had five daybeds. This is a pretty nice area to relax if you have a long layover. In the front left of the lounge are the bathrooms, as well as the shower rooms. In the back right of the lounge is a First Class Suite, as it’s called, which I believe is reserved for VIPs (though I think it’s just a private room, so it’s not like it has many amenities). 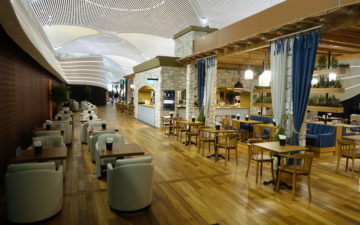 There are two food options in the lounge — there’s either a buffet near the entrance to the lounge, or there’s a restaurant. The buffet in the main part of the lounge is quite limited. It just consists of a variety of bread, pastries, salad, and cereal. There’s also a coffee machine, though unlike the barista coffee in the business class lounge, your only option here is self-serve from a machine. Then the restaurant area had a small buffet, though the selection was underwhelming. You had a small selection of pastries, as well as yogurt and cereal. The restaurant in the lounge only opens at 6:30AM, so I sat down at that point. Within about 10 minutes just about all the tables were taken, though there wasn’t actually any service. About 15 minutes later a server showed up, took everyone’s order in a great rush, and then disappeared. The food showed up about 15 minutes later. I just ordered the kaya toast. My flight was scheduled to board at 8:40AM according to my boarding pass (a full hour prior to departure), so after spending some time in the lounge working, I headed into the terminal around 8AM and figured I’d walk around a bit. Unfortunately plane spotting opportunities in the terminal are fairly limited, given that by the windows you have individual gates, and each has a separate security check, so you can’t just walk to the windows. Fortunately there were a few areas from which you could plane spot. My flight was departing from gate C35, and to my surprise I was the first person there. As it turned out, boarding didn’t actually start at 8:40AM, but rather the gate just opened at that point. Security was painless, and I was quickly through. Only one slight problem — there was no plane. Within about 10 minutes a beautiful A350 was towed up to our gate — I love the Malaysia Airlines livery on this plane. The crew also showed up around this time. Not only did one crew show up, but I guess there was a crew deadheading to Tokyo, because we had two full crews at the gate. The departure monitor indicated boarding should start around 9:10AM. In reality there was a delay, and we only actually started boarding around 9:25AM. I couldn’t wait to finally try the Malaysia A350! This lounge has the benefit of being more private and I suppose more exclusive, so during peak hours I imagine it’s not as crowded as the business class section. However, I think I actually prefer the business class section of the lounge. I like the design of the business lounge more, as it has higher ceilings and feels airier. Furthermore, the lounge has barista made coffees and a larger buffet. The only real advantage of the Business Suite/Emerald portion of the lounge is that it features a restaurant area, though based on my experience there, I wasn’t very impressed. 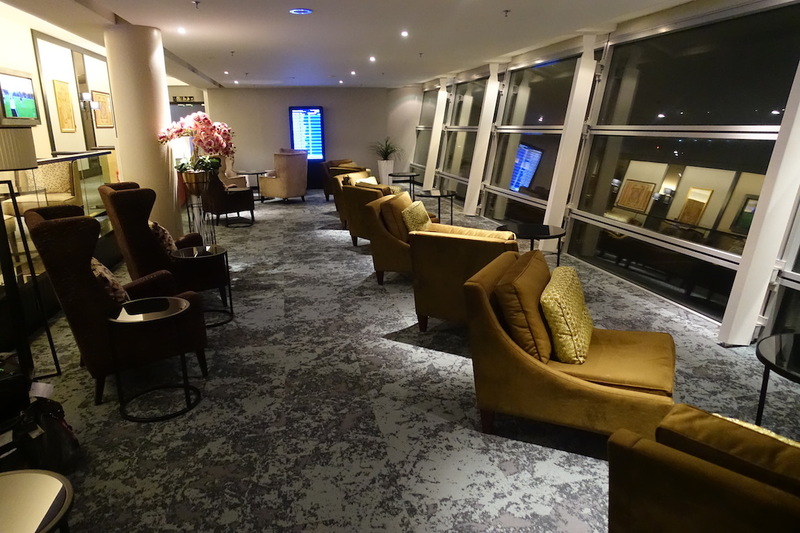 If you’ve used the Malaysia Airlines First/Business Suite/Emerald Lounge, what was your experience like? @Ben — I’m surprised you are somewhat critical of this lounge. I’ve found the service and food to be exemplary, apron views too boot. Some of their wines were great as well. So, which lounge does a regional business class traveler use? Evening departure and the restaurant area was packed. Managed to get a seat in the last vacant table. Waited for 15 minutes to have my order taken and realized it just wouldn’t happen so I left and went to the Business Class lounge. Overall I found the lounge disappointing and the self service offering sad. 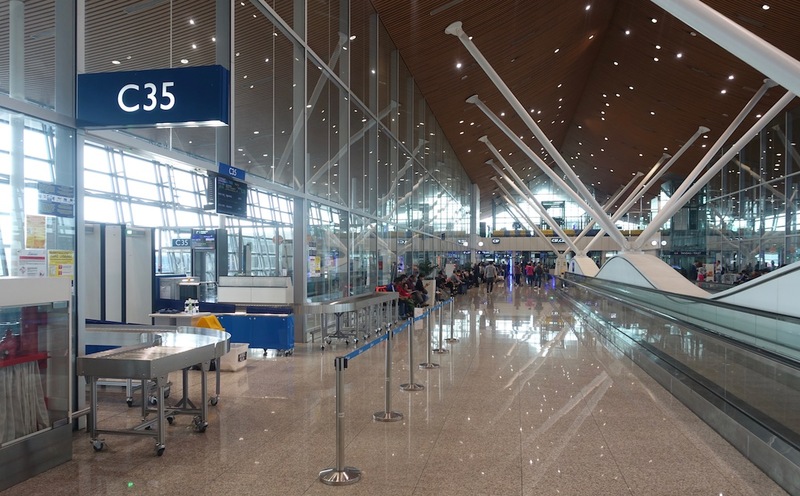 I recently flew Malaysia First (right before they rebranded as Business Suite). I asked a staff member if I could access the First Class Suite room. He said he would check with the desk. A few minutes later he came back and welcomed me into the room. It’s a nice, private room with fresh flowers and a great apron view. There’s also a private restroom and shower. The staff member came back to check on me about every 15 minutes to see if I needed anything. I’m pretty sure they still just refer to this as the First Class Lounge – they certainly did when I was last there a couple of months ago. Really no different to BA’s “First lounge” at Heathrow T5, which isn’t actually their First class lounge (but is for Oneworld purposes). like John said it. The *first class suite* can be used by business suit pax. think its not official, but they will always grant you access (if there isnt any vvip in the lounge). It’s now called the “BUSINESS SUITE/PLATINUM LOUNGE” now, if I remember correctly. Do note that barista made coffee and literally anything from the J side of the lounge can be requested from the staff (a la BA’s Galleries requesting for champagne). They have a door next to the buffet that leads to the J lounge, which is used to bring things between the lounges. Breakfast is a weak point of the lounge and I trust that you’ll be more impressed during dinner. It’s also so much nicer than the J lounge when the aussie-bound flight passengers start coming because it gets real crowded. That VIP room used to be a smoking lounge, at least it was the last time I passed through a few years ago. I guess they decided to repurpose it when they did their refresh. Yep, The VIP room was just the old smoking lounge which nobody ever seemed to use. With the refurbishment, the lunch menu was changed. The used to serve a decent steak, those days appear to be over. The most recent time I used the Emerald/First side of the lounge, I asked a staff member to let me through the glass door that connects directly into the Business lounge, and nicely asked her to wait for a couple of minutes whilst I helped myself to the (much better) Business class food to take back to the First lounge. It’s an odd state of affairs when Business is better than First!